How much of an investment must be made in each monitor tech before they can be introduced to the telemetry unit or the ICU? Days? Weeks? What if your applicants could complete a fun, affordable online arrhythmia course and arrive at your doorstep ready to man a bank of monitors? After completing our online arrhythmia course, the monitor technician will be equipped to successfully take your in house competency examination without further training. This will put them in front of the monitors, assuring the safety of your patients, faster and more confidently. Our course will equip the monitor technician with a basic understanding of the monitoring process as well as the ability to interpret all of the basic cardiac dysrhythmias that are required by most hospitals. They will be trained in the interpretation of both static and dynamic rhythm strips. Allow us to help you train monitor technicians that stand out from all the rest! Are you ready to make the change from Med-Surg to Critical Care or Telemetry but those confusing arrhythmias stand in your way? You’ve taken the course in nursing school, but it just didn’t make sense. You know you would make a great critical care or telemetry nurse but just haven’t been able to master arrhythmia interpretation. We have the answer for you. 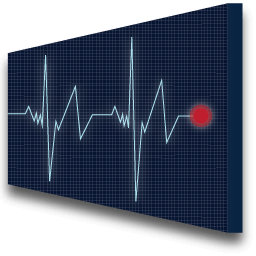 Our course will begin by explaining the monitoring process and then take you step by step through the knowledge you need to recognize the basic arrhythmias required to provide care to telemetry and critical care patients. The information is presented in a practical way that makes sense. Emphasis is placed on rhythms that are commonly seen in the hospital environment. A step-by-step process for interpreting cardiac rhythms will be presented with pointers that make it impossible for you to fail. Our online arrhythmia course is a valuable resource to those who have experience with arrhythmias, as well as the only course you will need as a newcomer to the challenging arena of arrhythmia interpretation. Let us give you the confidence it takes to succeed. This course is offered in in-person group format and online format. All our instructors hold current and valid ACLS instructor credentials from the American Heart Association. (Some customers require that our instructors additionally hold paramedic licensure, we can meet this requirement.) Take this course to fulfill your required job training. Bunch TJ, Hammill SC, White RD. Outcomes after ventricular fibrillation out-of-hospital cardiac arrest: expanding the chain of survival. Mayo Clin Proc. Brembilla-Perrot B, Beurrier D, Houriez P, et al. Wide QRS complex tachycardia. Rapid method of prognostic evaluation. Internat J Card. 2004;97:83-88. Couceiro R, Carvalho P, Henriques J, et al. On the detection of premature ventricular contractions. Conf Proc IEEE Eng Med Biol Soc. 2008;2008:1087-1091. Garmel GM. Wide complex tachycardias: understanding this complex condition: Part 1—epidemiology and electrophysiology. West J Emerg Med. 2008;9:28-39. Desbiens NA. Simplifying the diagnosis and management of pulseless electrical activity in adults: a qualitative review. Critical Care Medicine. 2008;36:391-396. Contact our Arrhythmia Interpretation Department at by email at terry@pacificmedicaltraining.com or by phone at 844-481-5238 to schedule an in-person training for your group (minimum of 10 people). Or see our online sales page.